You are here: Neurological Imaging/Daniel D. Ririe, M.D. Graduated from University of Utah School of Medicine Salt Lake City, UT. He attended Mercy Hospital of Pittsburgh for his transitional medical internship. The residency program he chose was with Oregon Health and Science University. His fellowship training in neuroradiology was also from Oregon Health and Science University. 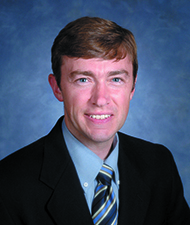 Dr. Ririe joined Boise Radiology Group in August, 2005. In his free time, Dr Ririe likes to backpack and spend time with his family.